There is still a portion of new music fans that view electronica with suspicion, that if it can’t be done with the traditional tools (guitars, drums, vocals) then it’s not worth the effort. Such a shame really because this genre has so much to offer both in creative and experimental terms. Take, the Greg Hunt led, Brooklyn based trio of Huntronik who make real songs with their samplers, throwing in lots of guitars and drums too it must be said. For much of the time Huntronik are pushing the boundaries but hidden amongst the new directions are genuinely pretty ditties. 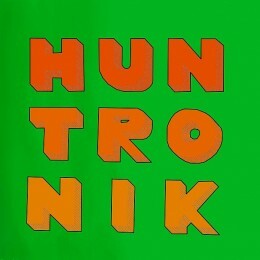 Tracks such as ‘Baldy’ and ‘We Can Build You’ could make perfect mixtape material but you’ll find for the most part the songs on ‘Huntronik’ come alive in the context of the rest of the album. What a nice surprise to find a genuinely rewarding album in a shuffle obsessed music listening landscape.